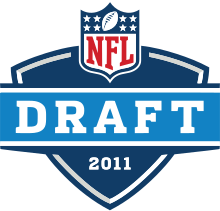 The 2011 NFL Draft was the 76th installment of the annual NFL Draft, where the franchises of the National Football League select newly eligible football players. Like the 2010 draft, the 2011 draft was held at Radio City Music Hall in New York City, New York, over three days: this year, the first round took place on Thursday, April 28, 2011; the second and third rounds took place on Friday, April 29; with the final four rounds on Saturday, April 30, 2011. The Carolina Panthers, who had the worst record for the 2010 NFL season at 2–14, had the right to the first selection in each round of the draft. With the first pick the Panthers selected Auburn University quarterback Cam Newton, who was the 2010 Heisman Trophy winner. A second Heisman Trophy winner, running back Mark Ingram Jr. from Alabama was selected by New Orleans late in the first round. This was the eleventh draft which included multiple Heisman winners, and the first time ever that it has occurred in consecutive drafts (Sam Bradford and Tim Tebow in 2010). Five of the first six picks played college football in the Southeastern Conference (SEC). For the second consecutive year—and the third time in NFL history—the top two selections of the draft won Offensive and Defensive Rookie of the Year awards, respectively. The top two picks in the draft, Cam Newton and Denver linebacker Von Miller, played against each other in Super Bowl 50 on the teams that drafted them. This marked the first time that the top two picks in a single draft faced each other in the Super Bowl. The Broncos won, 24-10, with Miller winning Super Bowl MVP. It is considered one of the best drafts in recent years, with many players with Hall of Fame level talent, including 3-time Defensive Player of the Year J. J. Watt, 2015 NFL MVP Cam Newton, Super Bowl 50 MVP Von Miller, 2015 and 2018 receiving yards leader Julio Jones, and perennial All-Pro players such as Richard Sherman, A. J. Green, Tyron Smith, Justin Houston, and Patrick Peterson. Despite an ongoing labor dispute between league owners and players over a new collective bargaining agreement (CBA), a provision in the expired CBA ensured that this draft would still take place, despite the fact that the owners had imposed a lockout to prevent the start of the league year. Fans in attendance at the draft expressed their displeasure with the lockout by booing NFL commissioner Roger Goodell during the event and chanting "We want football." Due to the labor situation and the lockout, franchises were not able to trade players for draft selections (trades involving only selections were permitted), and were unable to sign or even contact drafted or undrafted players until the lockout was lifted. Because of the lockout, the Panthers could not sign or even negotiate with their first draft pick before the draft began, as other teams have done in years past. The restriction on trading players extended to players selected in this draft—teams were unable to swap any player once selected, e.g. as happened in 2004 when the San Diego Chargers and New York Giants completed a draft day trade involving Eli Manning and Philip Rivers who had been selected first and fourth respectively. In addition, with no agreement in place between owners and players mandating future drafts, teams were advised by the league that any trades involving future draft picks would be made at the teams' "own risk". This warning did not dissuade several teams from making trades involving future selections. The National Football League Players Association (NFLPA) considered plans to dissuade potential prospects from attending the draft, but a record 25 potential draftees attended the event, including Von Miller, who was one of the named plaintiffs in the players' antitrust lawsuit against the league. A record 56 underclassmen announced their intention to forgo their remaining NCAA eligibility and declare themselves eligible to be selected in the draft. Of the 56 eligible underclassmen, 43 (or 76.8%) were drafted. The selection of Newton, a junior, marked the third straight draft where the first overall selection was an underclassman. Since non-seniors were first eligible to be drafted in 1990, fourteen first overall picks (including six of the last seven) have been players who have entered the draft early. Eight of the first ten players chosen in this draft were non-seniors, which broke the record of six set in 1997 and matched in 2006. Jake Locker and Von Miller were the only two seniors among the first ten draftees. The draft order is based generally on each team's record from the previous season, with teams which qualified for the postseason selecting after those which failed to make the playoffs. A supplemental draft was held on August 22, 2011. For each player selected in the supplemental draft, the team forfeits its pick in that round in the draft of the following season. Six players were available in the supplemental draft, but only one was selected. Dallas Cowboys Dan Bailey † K Oklahoma State Big 12 Kicked for Dallas Cowboys and Minnesota Vikings. Denver Broncos Chris Harris Jr. † CB Kansas Big 12 4× Pro Bowl, 3× All Pro, Super Bowl 50 Champion, was not invited to combine. San Francisco 49ers Chris Hogan WR Monmouth University NEC Starting wide receiver for the New England Patriots and won Super Bowl 51 with the New England Patriots as a starter. Seattle Seahawks Doug Baldwin † WR Stanford Pac-10 First undrafted rookie free agent to lead his team in receptions and yards receiving since the AFL-NFL merger and won Super Bowl 48 with the Seattle Seahawks as a starter. Caught an NFL-leading 14 touchdowns during the 2015 NFL season. #154: Kansas City/Detroit swap. see #140: Detroit/Kansas City swap. ^ #155: New Orleans → Washington (PD). See #72: Washington → New Orleans above. ^ #187: Kansas City → Tampa Bay (PD). See #135: Tampa Bay → Kansas City (PD). above. #189: New England → Denver (PD). see #99: Denver → New England. ^ #228: Baltimore → St. Louis (PD). See #180: St. Louis → Baltimore (PD). above. ^ Dallas forfeited its seventh-round selection pick to take DT Josh Brent in the 2010 Supplemental Draft. ^ Chicago forfeited its seventh-round selection to take RB Harvey Unga in the 2010 Supplemental Draft. ^ Cam Newton was the 2010 winner of the Heisman Trophy which is awarded annually to the player deemed the most outstanding player in collegiate football. ^ Mark Ingram was the 2009 winner of the Heisman Trophy which is awarded annually to the player deemed the most outstanding player in collegiate football. "2011 NFL Draft Tracker". NFL. Archived from the original on May 2, 2011. Retrieved May 3, 2011. "2011 NFL Draft Trade Tracker". NFL. Archived from the original on October 31, 2011. Retrieved May 3, 2011. "2011 NFL Draft Tracker". FFToday.com. Retrieved May 3, 2011. "2011 NFL Draft Pick Transactions". ProSportsTransactions.com. Archived from the original on October 31, 2011. Retrieved May 3, 2011. ^ a b c Pompei, Dan (April 29, 2011). "NFL 'looking into' Bears' botched trade with Ravens". Chicago Tribune. Retrieved April 29, 2011. ^ a b c d e f g "Cleveland Browns select Baylor defensive lineman Phil Taylor after busy night of draft trading". The Plain Dealer. April 28, 2011. Retrieved April 28, 2011. ^ a b c Stellino, Vito (April 28, 2011). "Blaine Gabbert: Face of the Jaguars' future: Jags pull major surprise again with deal for Missouri QB". The Florida Times-Union. Retrieved April 29, 2011. ^ "Seymour dealt to Raiders". ESPN. September 6, 2009. Retrieved May 2, 2010. ^ a b "Patriots trade 28th pick to Saints". ESPN. April 28, 2011. Retrieved April 28, 2011. ^ Manza Young, Shalise (April 23, 2010). "Patriots trade No. 89, pick WR T. Price at No. 90". The Boston Globe. Archived from the original on April 26, 2010. Retrieved April 23, 2010. ^ a b c d White, David (April 30, 2011). "49ers draft Nevada quarterback Colin Kaepernick". San Francisco Chronicle. Archived from the original on April 30, 2011. Retrieved May 2, 2011. ^ a b c Chappell, Mike (April 30, 2011). "Colts use their 2nd pick on Villanova LT Ben Ijalana". The Indianapolis Star. Retrieved May 2, 2011. ^ a b c Pompei, Dan (April 29, 2011). "Paea fits the bill for Bears: Oregon State defensive tackle the versatile player Angelo was looking for". Chicago Tribune. Retrieved May 2, 2011. ^ a b c d e f g Birkett, Dave (April 29, 2011). "Lions take Boise State WR Titus Young, Illinois RB Mikel Leshoure in second round of NFL draft". Detroit Free Press. Retrieved May 2, 2011. ^ a b c "Patriots trade third pick of 2nd round to Texans". Boston Herald from AP. April 29, 2011. Retrieved May 2, 2011. ^ "Former All-Pro Cromartie headed to Jets". ESPN. March 5, 2010. Retrieved May 2, 2010. ^ a b c d Salguero, Armando (April 30, 2011). "Thomas better be worth moving up for". The Miami Herald. Retrieved May 2, 2011. ^ Schefter, Adam (June 19, 2010). "Redskins add OT Brown in trade". ESPN. Archived from the original on June 22, 2010. Retrieved June 19, 2010. ^ "Source: Vikes have deal for Randy Moss". ESPN. October 6, 2010. Archived from the original on October 7, 2010. Retrieved October 6, 2010. ^ a b c Ganguli, Tania (April 29, 2011). "Jaguars eye changing of guard with third-round pick Will Rackley". The Florida Times-Union. Retrieved May 2, 2011. ^ a b c "Ravens move up, take Central Florida OT Jah Reed". The Miami Herald from AP. April 29, 2011. Retrieved May 2, 2011. ^ a b c "Patriots make third trade of draft in Raiders deal". Boston Herald from AP. April 29, 2011. Retrieved May 2, 2011. ^ Reiss, Mike (September 14, 2010). "Laurence Maroney trade analysis". ESPNBoston.com. Archived from the original on September 17, 2010. Retrieved September 14, 2010. ^ "Sources: Patriots trade for Deion Branch". ESPN. October 11, 2010. Archived from the original on October 13, 2010. Retrieved October 11, 2010. ^ a b Cummings, Roy (April 30, 2011). "Bucs trade up for TE Stocker, add S Black". The Tampa Tribune. Archived from the original on May 3, 2011. Retrieved May 2, 2011. ^ a b c d e Jones, Mike (April 30, 2011). "Redskins trade up in fourth round to take RB Roy Helu". The Washington Post. Retrieved May 2, 2011. ^ Glazer, Jay (October 5, 2010). "Marshawn Lynch traded to Seahawks". Fox Sports. Archived from the original on October 7, 2010. Retrieved October 5, 2010. ^ a b c d "Broncos trade up for TE Julius Thomas". MSNBC. April 30, 2001. Retrieved May 2, 2011. ^ Stroud, Rick (October 19, 2010). "Bucs trade for Chiefs' DE Alex Magee". The St. Petersburg Times. Archived from the original on October 22, 2010. Retrieved October 19, 2010. ^ a b c Ledbetter, D. Orlando (April 30, 2011). "Falcons select RB Jacquizz Rodgers in the 5th round". The Atlanta Journal-Constitution. Archived from the original on May 5, 2011. Retrieved May 2, 2011. ^ Wobschall, Mike (September 3, 2010). "Pending Physicals, Vikings Trade Rosenfels, Reynaud". Vikings.com. Archived from the original on September 5, 2010. Retrieved September 3, 2010. ^ a b c Ulrich, Nate (April 30, 2011). "NFL Draft 2011: Browns trade up into fifth round, select Pitt OL Jason Pinkston with 150th overall pick". Akron Beacon Journal. Retrieved May 3, 2011. ^ a b c d "Jets take Louisville RB Powell in 4th round". The Wall Street Journal from AP. April 30, 2011. Retrieved May 2, 2011. ^ Allen, Percy (August 31, 2010). "Josh Wilson traded to Baltimore for 2011 draft pick". The Seattle Times. Archived from the original on September 2, 2010. Retrieved September 3, 2010. ^ a b c "49ers trade up to get guard Daniel Kilgore". The San Francisco Examiner from AP. April 30, 2011. Archived from the original on May 29, 2012. Retrieved May 2, 2011. ^ "Quinn sent to Broncos for Hillis, picks". ESPN. March 15, 2010. Archived from the original on March 23, 2010. Retrieved May 2, 2010. ^ Johns, Greg (August 18, 2010). "Seahawks trade Lawrence Jackson to Lions". Seattle Post-Intelligencer. Archived from the original on August 21, 2010. Retrieved September 3, 2010. ^ a b c d Wine, Steven (April 30, 2011). "Dolphins draft Tulsa's Clay". The Miami Herald from AP. Retrieved May 3, 2011. ^ Leahy, Sean (September 6, 2010). "Ravens trade WR Mark Clayton to Rams with T.J. Houshmandzadeh on board". USA Today. Retrieved September 6, 2010. ^ Bowen, Les (March 9, 2010). "Eagles trade Reggie Brown to Buccaneers for 2011 pick". Philadelphia Daily News. Archived from the original on May 10, 2011. Retrieved April 7, 2011. ^ "Cardinals trade Reggie Wells to Eagles". ESPN. September 3, 2010. Retrieved September 3, 2010. ^ Yuille, Sean. "Lions Have Fewest Picks In 2011 NFL Draft". Pride of Detroit (blog). Retrieved April 5, 2011. ^ "Report: Niners Trade Balmer to Seattle". csncalifornia.com. CSNBayArea.com Staff. August 16, 2010. Archived from the original on July 24, 2012. Retrieved August 19, 2010. ^ a b Tadych, Frank (April 30, 2011). "This trade was made ... just because". NFL.com blog. National Football League. Archived from the original on May 2, 2011. Retrieved May 2, 2011. ^ Silverstein, Tom (April 13, 2009). "Packers trade extra long snapper to Carolina". Milwaukee Journal Sentinel. Retrieved May 2, 2010. ^ Yuille, Sean. "Lions Get Back 2011 NFL Draft 7th-Round Pick, Lose 2012 Pick Instead". Pride of Detroit (blog). Retrieved April 5, 2011. ^ Ridenour, Marla (March 10, 2010). "Wallace trade official". Akron Beacon Journal. Archived from the original on March 13, 2010. Retrieved May 2, 2010. ^ "Dolphins send Smiley to Jaguars". ESPN. Associated Press. May 25, 2010. Retrieved May 25, 2010. ^ "Cowboys trade Patrick Crayton to Chargers for 2011 draft pick". ESPN. September 3, 2010. Archived from the original on September 5, 2010. Retrieved September 3, 2010. ^ Reid, Jason and Paul Tenorio (September 4, 2010). "Redskins trade Justin Tryon (updated)". The Washington Post. Retrieved September 5, 2010. ^ "Eagles land Antwan Barnes for pick". ESPN. September 4, 2010. Archived from the original on September 7, 2010. Retrieved September 5, 2010. ^ McLane, Jeff (September 5, 2010). "Eagles trade guard Stacy Andrews to Seattle". The Philadelphia Inquirer. Archived from the original on September 7, 2010. Retrieved September 5, 2010. ^ Cimini, Rich (September 7, 2009). "Jets trade for backup QB Kevin O'Connell, raising questions about Kellen Clemens' future". Daily News. Retrieved May 2, 2010. ^ "49ers sign Carr, deal Hill to Lions". ESPN. Associated Press. March 16, 2010. Archived from the original on March 23, 2010. Retrieved May 2, 2010. ^ "2010 – 76th Award Cam Newton Auburn University". Heisman Trust. Archived from the original on November 4, 2011. Retrieved April 30, 2011. ^ "Nine Interesting Facts About Heisman Trophy Award Winners In The NFL Draft". IQFB.com. Archived from the original on November 4, 2011. Retrieved May 9, 2011. ^ "NFL Draft Notebook". Salisbury Post. AP. April 29, 2011. Archived from the original on November 4, 2011. Retrieved April 29, 2011. ^ The other two times this occurred were 1981 and 2010. ^ Fenelon, Andy. "How 2011 NFL Draft set stage for Super Bowl 50 matchup". NFL.com. National Footbal League. Retrieved February 9, 2016. ^ "Watch NFL Draft Online – Live NFL Draft 2011 Streaming Football Games in High Quality". PRWeb. April 28, 2011. Archived from the original on November 4, 2011. Retrieved April 29, 2011. ^ Maske, Mark (December 15, 2010). "Time is short for NFL, players". Washington Post. Archived from the original on November 4, 2011. Retrieved December 21, 2010. ^ Corbett, Jim (May 2, 2011). "Risk takers: Will bold moves in NFL draft pay off this season?". USA Today. Archived from the original on November 4, 2011. Retrieved May 4, 2011. ^ Cranston, Mike (April 27, 2011). "No. 1, with a question". Charlotte Post. Archived from the original on November 4, 2011. Retrieved November 4, 2011. ^ Smola, Jared (May 23, 2014). "Lockout Losers". Draft Sharks. Archived from the original on May 23, 2014. Retrieved May 23, 2014. ^ Brinson, Will (December 19, 2010). "Casserly: 'Draft will go on as scheduled'". CBS Sports. Archived from the original on November 4, 2011. Retrieved November 4, 2011. ^ Florio, Mike. "Teams may trade future draft picks "at their own risk"". Profootballtalk.com. Archived from the original on November 4, 2011. Retrieved March 25, 2011. ^ "George Atallah: No draft boycott". ESPN. March 16, 2011. Archived from the original on November 4, 2011. Retrieved November 4, 2011. ^ "League-record 25 players to attend NFL draft at Radio City". NFL.com. April 25, 2011. Archived from the original on November 4, 2011. Retrieved May 4, 2011. ^ Leahy, Sean (April 28, 2011). "Von Miller greets Roger Goodell after Broncos choose him at No. 2". USA Today. Archived from the original on November 4, 2011. Retrieved May 4, 2011. ^ Struckmeyer, Andrew (February 9, 2011). "Draft Dose: Underclassmen affected by coaching changes". Pro Football Weekly. Archived from the original on November 4, 2011. Retrieved April 4, 2011. ^ a b Zimmer, John; Marini, Matt, eds. (2011). Official 2011 National Football League Record & Fact Book (PDF). New York: National Football League. ISBN 978-1-603-20887-1. Archived (PDF) from the original on October 29, 2013. Retrieved October 29, 2013. ^ a b Gosselin, Rick (April 29, 2011). "Commissioner Roger Goodell booed; Cam Newton goes No. 1 to Carolina". The Dallas Morning News. Archived from the original on November 4, 2011. Retrieved April 29, 2011. ^ "2010 – 76th Award Cam Newton Auburn University". Heisman Trust. Archived from the original on November 4, 2011. Retrieved May 4, 2011. ^ "2009 – 75th Award Mark Ingram University of Alabama Back". Heisman Trust. Archived from the original on November 4, 2011. Retrieved May 4, 2011. ^ a b Bunting, Wes (July 15, 2010). "2010 supplemental draft breakdown". National Football Post. Archived from the original on November 4, 2011. Retrieved January 4, 2011. ^ Floyd, Brian (April 30, 2011). "2011 NFL Draft Results: SEC Tops Picks By Conference List". SB Nation. Archived from the original on November 4, 2011. Retrieved May 4, 2011.